What is Hard Light, Soft Light and Diffused Light? Hard light leaves hard-edged shadows – they are well defined with a clear border. The best example is the shadow from sunlight in a clear sky. Soft light leaves blurry-edged shadows. When they’re slightly soft you can still make out the shape of the object casting the shadow. A super soft light almost makes believe there’s no shadow, the best example being an overcast day. Specular light is light that is brighter at the center and then tapers off at the edges. The entire beam doesn’t have an even concentration of light. The light from a torchlight is the best example of this. Diffused light is light that has an even concentration of light across the beam. It’s as if someone threw a light blanket on the object. Whatever is illuminated is illuminated evenly. 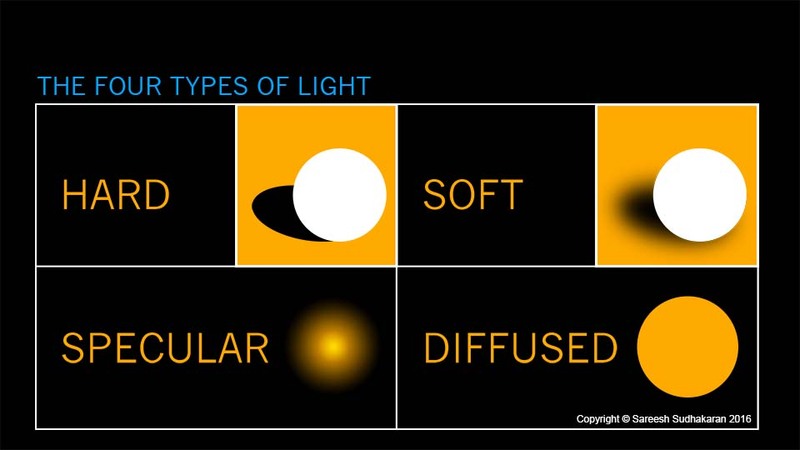 Many people confused soft and diffused light simply because they don’t know the distinction. You can create soft light with a large light source. Even a hard light source like a 1×1 LED panel can create soft light if you bring it close enough. By diffusing the light evenly across a diffusion material. It’s for this reason some pros use a book light, which is a bounced source that is further diffused so the light is as diffused and even as possible, yet soft because of the large size of the frame.